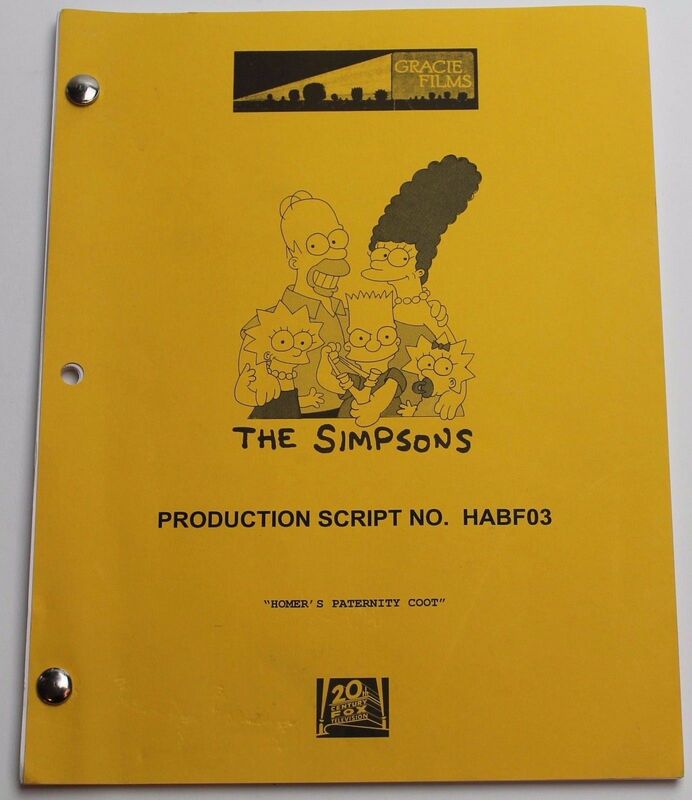 Homer's Paternity Coot is the tenth episode of The Simpsons' seventeenth season. It originally aired January 8, 2006. "After a frozen mailman from the 60s is discovered, all the letters he was carrying are delivered to their destinations, including one for Mona Simpson from a man telling her about their son, which suggests Grampa might not be Homer's father. 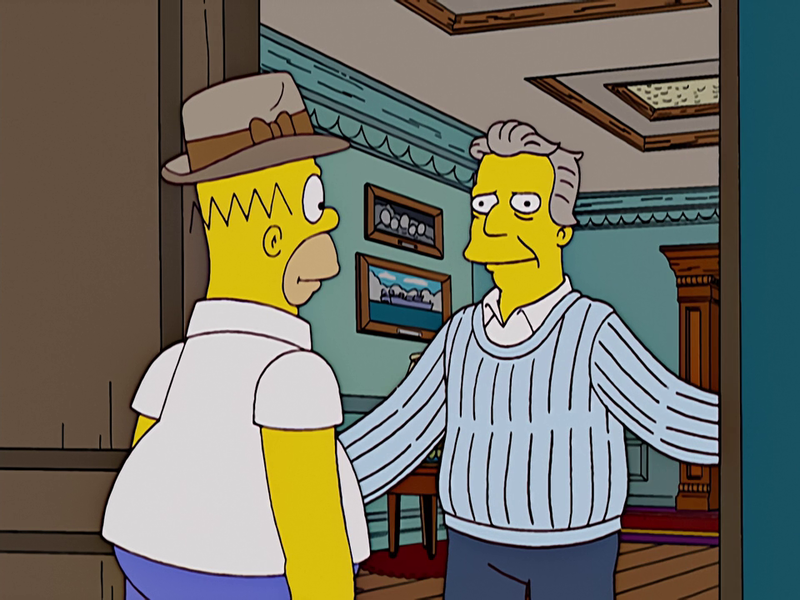 Homer goes to find his true father, someone called Mason Fairbanks." After Marge and Lisa see a commercial for a store that sells damaged items from fires for cheap prices, they set off immediately. However, when they're on the highway, they see that there's a new toll booth that charges seventy-five cents. Not wanting to pay, Marge takes a backroad. Other drivers see her doing it and follow her. Mayor Quimby is angry that no one is using the toll booth, especially as he cannot fix the water fountain by "de-python-ing" it without the seventy-five cent tax, and blocks off the backroad. The next week, Marge is back driving and sees that she now cannot avoid the toll. Also, she can't back up because of tire spikes on the road. When she finally gets to the booth, she refuses to pay and backs up. The bumper backs into the car behind her, and soon, everyone's tires run into the spikes. The damaged tires are taken to the Springfield Tire Fire, and the smoke travels to Mount Springfield, causing some snow to melt. On the news, it is revealed that a frozen mailman from 1966 was trapped in the mountain for forty years. The old mail is delivered, including a letter for Mona Simpson, Homer's mother. It is from her old lifeguard boyfriend, whose name begins with an M, who writes that if Mona replies to the letter, she has chosen him, and if she doesn't, she is choosing to stick with Abe. But he also writes that "in my heart I'll know that the baby in your belly is mine." Homer goes to the library to find his supposed father by looking in "Lifeguards of Springfield in the Twentieth Century." The only person in there whose name begins with M is Mason Fairbanks. Homer goes to his relatively large house pretending to be a reporter. He tells him that he's interviewing people who wear sweaters, and he is let inside. Mason shows him around his home, and he even shows him his ship, The Son I Never Knew. Homer eventually tells him that he thinks that he is his father, and Mason is delighted. He takes Homer and the rest of the family (excluding Grampa) on a ride on his ship and tells them the story of a lost emerald treasure. The family is impressed with him, but when they come home, Grampa is angry that Homer would even think that Mason could be his real father. They decide to have a DNA test, and after a suspenseful wait, it is revealed that Homer's real father is Mason Fairbanks. While Marge, Bart, Lisa and Maggie are having an awkward, uneventful visit with Grampa, Mason and Homer are underwater (which is terribly polluted by nuclear waste) in their own individual submarines looking for the lost treasure. Homer gets separated from Mason, and he follows a small light that he thinks is him. It is actually a glowing fish, but it's too late, because Homer gets stuck in some coral. His oxygen begins to run out, and he starts to see flashbacks including him and Abe. When his last bit of oxygen runs out, the last thing he sees is Mason heading towards him. When he wakes up, he's in the hospital, and Bart tells him that he's been in a coma for three days. When they all leave, Grampa comes in the room and tells Homer that he switched the labels on the DNA samples, and that he wanted Homer to be happy. They share an emotional moment, and it is official: Abe is Homer's real father. The episode ends with Mason teaching Homer not to touch the stove. Modified on October 16, 2018, at 14:32.